Preheat oven to 400 degrees (200 Celsius). Peel and cut squash in half. Remove seeds, then cut into even-sized chunks. Smaller means less cooking time. Put on a baking sheet or roasting pan. Drizzle with olive oil and salt. Roast 15 minutes. Peel and cut onion into quarters. After squash has cooked about 15 minutes, turn heat down to 370. Add onion quarters to the baking sheet, trying to coat with olive oil. (Add more oil and salt if necessary). Roast another 15 minutes, or until butternut squash is soft. When squash is easily pierced with a fork, take out of the oven. 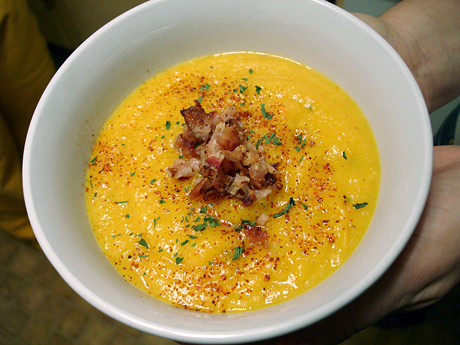 In a large soup pot, cook bacon or pancetta pieces over medium-high heat until crisp. Transfer to a paper towel-lined plate, leaving a little bacon grease in the pot. Roughly chop onion pieces that have been roasting. Add to the pot, cook a little more until completely soft. Turn off heat. Add squash pieces and juice from half a lime. Add white pepper and chili or cayenne pepper at your discretion. Ideally you have an immersion blender for this next step. Otherwise, a food processor or stand blender will work, it just might require you to do this in batches. Puree squash, onion and 3 cups of stock. Add 4th cup of stock as necessary for desired thickness. Serve with a spoonful of bacon bits and a sprinkle of chili or cayenne. Add some chopped cilantro on top for color, plus it would go well with the lime and chili. With some good crusty bread, this serves four.